Who says Indians only prefer frugal motorcycles? For years, we craved a fast, performance-oriented motorcycle at a price that didn't require one to break the bank. 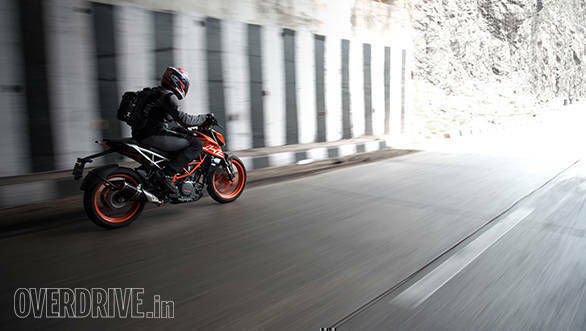 That call was answered by KTM, back in 2013, when it launched the phenomenal 390 Duke. It was lapped up for its incredible price-to-performance ratio and was undoubtedly one of the most popular motorcycles that went on sale in the country. It satiated a need that was lingering for far too long, introducing us to a side of motorcycles that many didn't know existed. The old Duke 390, though, had a few rough edges. The 2017 390 Duke though? Boy oh boy, what a step up this is. 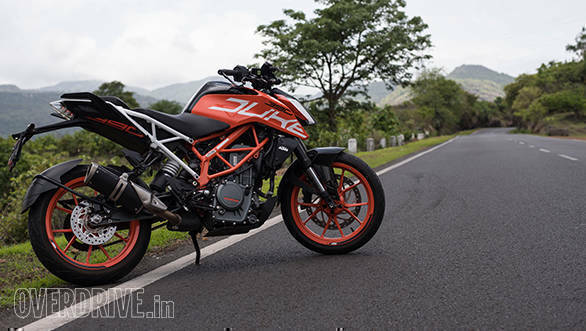 One of the biggest brickbats that the previous 390 Duke received was that it looked way too similar to the 200 Duke, save for the flashy orange wheels and the sticker job. 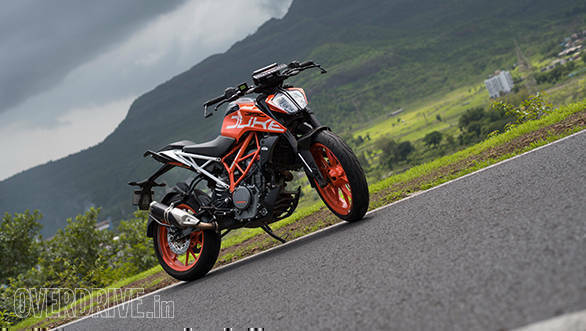 The 2017 390 Duke now looks distinguished enough to befit the mantle of the flagship in the KTM Duke range in India. 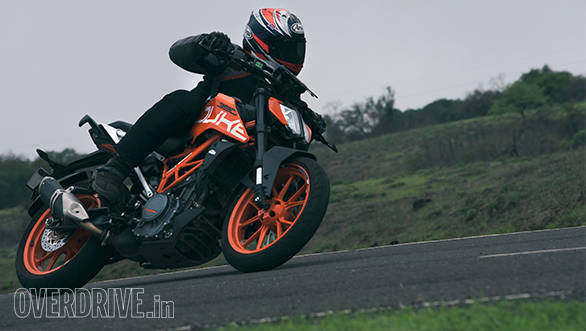 While it does share its KTM 1290 Super Duke-inspired styling with its smaller sibling, the 250 Duke, the 390 gets a raft of distinguishing features such as the LED headlamps, the large TFT instrument cluster, and the brand-new bright orange wheels and panels that contrast well with the black, steel fuel tank. The test bike, you see here, is a customer motorcycle, who's chosen to ditch the standard orange hand guards and mirrors. The seats are also wider and longer, offering a fair amount of room to move around. The seat height, at 830mm, and the rear set footpegs also result in a slightly more forward-biased and focused riding position. It, however, is not taxing as one might perceive. In fact, the shape of the tank allows you to sit comfortably, knees locked into the tank panels. Personally, I quite like how sharp and focused the motorcycle looks. The exposed trellis frame, rear subframe and minimal bodywork lend it that raw KTM naked-bike look, and I'm sure the design will appeal to a large chunk of buyers. The only complaint I have is the tail lamp design that is reminiscent of the units on the Bajaj Pulsar line-up, especially when the Duke is viewed from the rear end. 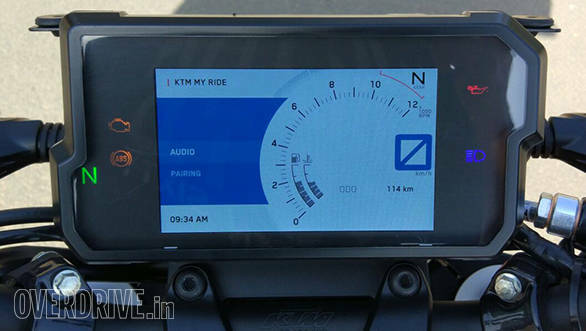 The talking point for many, when the bike was revealed, was the cool TFT instrument panel, a feature usually seen on bigger capacity, bigger money motorcycles. It certainly is a standout feature and I like the range of customisation and spread of necessary information that I'd like to see, when on the move. The screen and associated electronics do have hiccups though. Our test bike just couldn't hold on to the date and time when you set it. KTM Service has asked for the bike for a software update. The LED headlamps also cut out momentarily and re-start now and then. Some glitches it seems that KTM still has to iron out. If there's one thing that defines a 390 Duke, it has to be the explosive performance from the 373cc, liquid-cooled, single-cylinder engine. 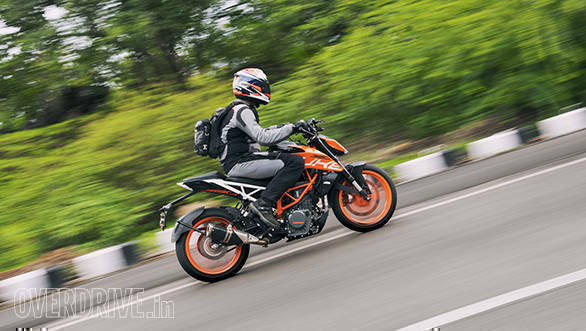 While the motor in the 2017 390 Duke is largely unchanged, it gets a few tweaks which along with the ride-by-wire system ensure the motor meets Euro-IV emission norms. The 4-valve, DOHC motor produces the same 43.5PS at 9,000rpm; however, the torque has gone up 2Nm to 37Nm at 7,000rpm. Thumb the starter and the motor settles into a gruff idle, the one you'd expect from a big bore, big piston, single-cylinder motor. The engine note is muted in comparison to the sound from the previous bike's underbelly exhaust. The new Duke, in fact as Shumi pointed out, sounds a lot like a dirt bike, in a good way, of course. The big single also sends out some vibration that creeps into the handlebars and the footpegs, which I found a bit annoying until Shumi (who owns the previous 390 Duke) told me that this was a lot more pronounced in the old 390. I believe, if you are going to own a big, fast, single-cylinder motorcycle, some vibration is part and parcel of the experience, so it's all about getting used to it. Riding the bike in traffic takes some getting used to. The engine's character makes it feel a bit lumpy at low revs, sort of like an angry beast that wants to break away from the shackles. The motor, however, smoothens out post 2,500rpm and from then on, all hell breaks loose. The ferocity with which this Duke gathers pace is as astonishing as it's entertaining, and I simply couldn't get over the manic acceleration, every time I whacked the throttle open. The 0-100kmph dash was dispatched in 6.9s, on rain-soaked tarmac, and this figure will surely drop more than a bit on a dry surface. To put things into perspective, the previous 390 Duke could sprint from 0-100kmph in 5.6 seconds (dry conditions), so the 2017 390 Duke's timing is pretty impressive, especially when you consider the fact that the bike weighs 5kg more than the previous 390. The ride-by-wire also offers crisp throttle response, allowing you to dial in precise throttle inputs, and lay that power down, especially at corner exits. The bike will happily cruise at 120-130kmph all day long. However, you will have to deal with wind blast at those speeds. The obvious solution would be to install a screen, but from what I see, mounting one may not be easy. We didn't get a chance to test the top speed of the bike, but we suspect it should be similar to the previous bike's figures. 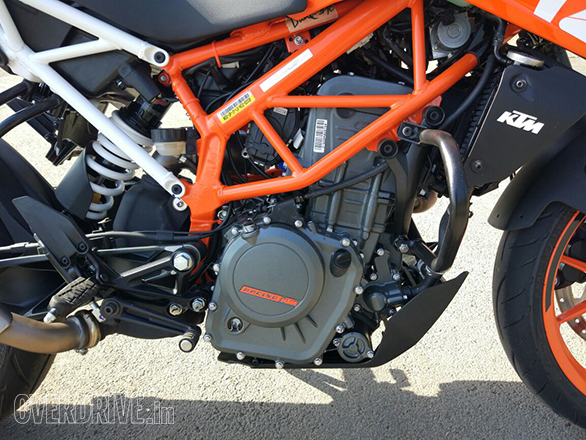 KTM has reduced the size of the rear sprocket to 44 teeth, which is taller gearing. As a result fuel efficiency has gone up marginally with the bike returning 26.6kmpl in the city and 34.5kmpl on the highway. But it also makes the Duke grumbly-stumbly at anything below 60kmph in sixth. These figures and a larger 13.4 litre fuel tank also help the fuel range on those long highway runs, again a bane of the previous motorcycle. One constant peeve of the old 390 Duke was the jittery ride over uneven and broken surfaces. That bike used to also feel a bit skittish while encountering mid-corner bumps. KTM has addressed that by employing new open-cartridge WP front forks, with 142mm travel and a new WP monoshock at the rear with 150mm travel. The new suspension's ability to soak bumps and undulations is vastly superior to the previous Duke's and that goes a long way in inspiring confidence, especially when leaned into a corner. The feedback from the chassis and the Metzeler tyres is stupendous, and this certainly is one bike you can push hard with ultimate confidence. The short 1,357mm wheelbase also makes the bike super flickable, making short work of slicing through city traffic. Like the old one though, there's an edgy urgency to the KTM chassis and a directness that takes some getting used to. The new one is calmer but only by a very small amount. All that manic performance would be of no use if KTM hadn't replaced the spongy brakes on the previous 390. The new 320mm brakes, with four-pot, radially mounted calipers offer tremendous stopping power. This is easily one of the better brakes I've experienced on an Indian motorcycle. The bite and feedback through the lever are exceptional, and you finally won't have to call on your lucky stars in a panic braking situation. ABS is, of course, standard. The 2017 KTM 390 Duke carries forward the legacy of its predecessor whilst bettering it in every aspect. The new 390 has lost that ragged, edgy nature and assumed a mature temperament, without losing its ability to offer a thrilling riding experience, every time you roll the throttle to the stop! 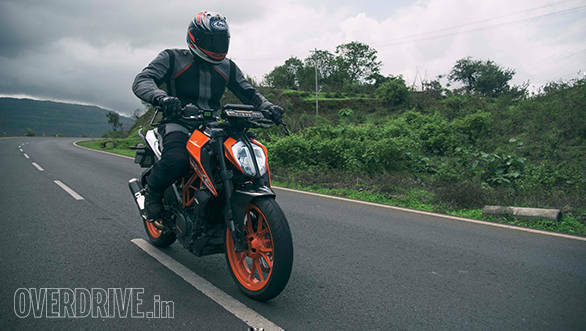 Besides its wide range of abilities, the KTM 390 Duke's impressive equipment list makes it a no-brainer. At Rs 2.67 lakh on-road Mumbai, no other bike comes close to the awesome package that the 390 Duke is, which seals the deal. If involving, thrilling and fast is your kind of motorcycle, the 2017 KTM 390 Duke ought to sit at the top of your most wanted list.